The last day of August and still nice weather. Looks like a couple of days coming up will be more like what August usually is. 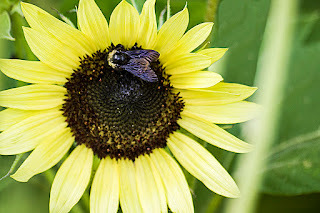 I captured this image of a Bumblebee enjoying one of my other different Sunflower varieties. This is a Lemon yellow variety and it did have a nice paler yellow color to it as compared to other Sunflowers.